This is a course about the place of science in our everyday lives. Most of us are not scientists and do not even plan to be scientists, but nonetheless science dominates our conception of the world. Most of us also, I suppose, believe that science tells us the truth about the world, and that generally what scientists say can be trusted. If we want to know the answer to something, or to a problem, then it is to science we turn. This is not only the case when it concerns nature, but also ourselves. But why do we trust science so much, even when many of us do not do science or have very little knowledge of what it is that scientists do? But what do we mean by a science and what does science do that religion does not? The answer might be that science has to do with facts and religion beliefs. But are we absolutely sure what we mean by facts and how are they the basis of the science? A fact seems to be something I observe. I say, ‘There is a table in front of me’ and there really is a table there in front of me. How do I know that? I can, because I can see it with my eyes. Facts then are something verified with the senses, in this case sight, whereas beliefs do not appear to be so. If a Christian says Jesus was resurrected on the third day, how can it be verified by simply looking at it? At most it is a report, but I cannot verify it myself. Religion does not seem to be about facts at all. It is something subjective, personal and a matter of faith rather than reason. How do we pick up concepts of things? Not simply by looking at them, otherwise we’d be right back at the same paradox again. Rather they are part of the conceptual background that makes up our world, and this conceptual background is something we learn in any given culture. Only in this way can I recognise something as something, rather than just a mysterious object that has suddenly appeared in my world, like the chair in the clearing of the jungle. The meaning of the chair, the fact that I can see it as a chair, is given by the context of its use. In this sense, if we were to apply this to our idea of science, scientific practice might define what a fact is and what it is not in advance of the research itself that is meant to explain these facts. In other words theories are not justified by facts, because in reality theories precede facts. Science already makes us aware of this because when we think of a fact, we don’t just think about a state of affairs but make statements about a state of affairs and these statements only make sense within a community of speakers that understand them. The fact isn’t that they is water on Mars, but that someone says that there is water on Mars, and that someone else can observe them and agree that they really is water on Mars. 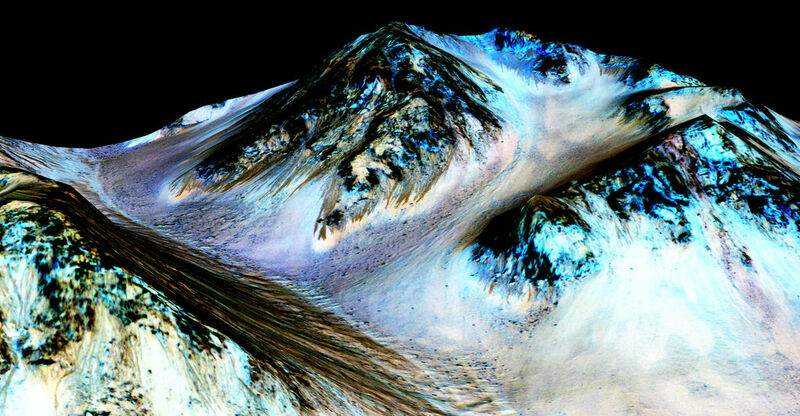 There would be water on Mars whether there was science or not, or even human beings. It only becomes part of a scientific theory when some says ‘There is water on Mars’, and then someone else gets a telescope and sees that this statement is true. What is important in this process is to understand that these observations are not infallible. The difference between science and religion is not that one in infallible and the other isn’t (however you might want to understand this). On the contrary observation is fallible. What we see is determined by how we look and how we look by the conceptual background we find ourselves in. But anyone can come along and show us that this background is incorrect and it is preventing us from seeing something. What is important, however, is how they do this. They do it by pointing to what is observable when we do change our theories, but also that this hypothesis can be tested by others. They do not do so by simply asserting a belief about something. The moon is made out of cheese, for example. So Chalmers can define science in this way: ‘According to the view put forward here, observations suitable for constituting the basis for scientific knowledge are both objective and fallible’ (Chalmers 1999, p.25). This means that objectivity is not the same as absolute truth, but quite the opposite: what is objective can be corrected and changed through observable evidence, whereas what is subjective cannot. A religious belief based on observation would not be a religious belief at all, but an inferior and poor scientific theory, since it would never be falsifiable. This does not mean that religion per se is inferior. This would be the case only if it were doing the same thing as science. The test for faith is not observation, but existence. To be a Christian, for example, is not to belief X, Y, Z, but to act as a Christian. Only when a Christian thinks their faith is supported by objective knowledge do they come in conflict with science, as for example those who people who think that the creation story is a scientific theory in competition with evolution. The irony, of course, is they are dependent on the very scientific method that they despise, for one can only disprove a science by another science.